Many animals avoid roads due to traffic disturbance, but there are also some species that use roads in their everyday life and even obtain resources from them. Understanding the factors that influence the intensity of road use by these species can help understand temporal patterns of road mortality and thereby maximise the cost-effectiveness of mitigation measures. Here, we use road transect counts conducted once a week for 9 consecutive years (2009–2017) to investigate environmental factors influencing road use in the red-necked nightjar (Caprimulgus ruficollis), a nocturnal insectivorous bird that frequents roads to forage and thermoregulate. We found that the intensity of road use by nightjars was affected by ambient temperature, amount of moonlight and wind conditions—all factors known to influence their foraging efficiency and thermoregulatory requirements. 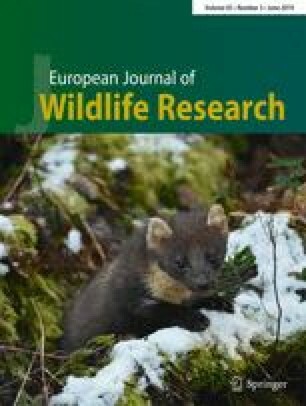 Specifically, the highest numbers of nightjars on roads occurred during no-wind conditions and on either dark-cold or bright-warm nights, suggesting that they preferentially use roads for thermoregulation under unfavourable weather conditions or to maximise food intake during periods of increased insect abundance (i.e. warm nights) and improved conditions for visual prey detection (i.e. full moon). Our results illustrate the role of environmental conditions as drivers of rapid changes in the use of roads by animals. Furthermore, this work suggests that analogous studies can be used to inform mitigation measures, so that mitigation efforts to prevent roadkills can be concentrated during periods of expected peaks in animal use of roads. We thank Sonia Sánchez, Basti Palacios, Javier-Ruiz Ramos, Carlos Molina and many other friends for help in data collection. Mark Brigham made constructive comments and suggestions that substantially improved the manuscript. CC was supported by the Spanish Ministry of Economy and Competitiveness through the fellowship SVP–2013–067686.